From the new fragrances, our Wild Fig & Saffron fragrance is also available as a hand cream and boasts the aromas of sweet wild figs blended with fiery spices of saffron. Layer this light hand cream onto hands to leave skin hydrated and healthy with a lasting deep, musky fragrance. 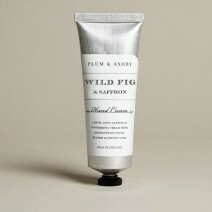 This hand cream is presented in a charming metal tube for an understated style, perfect to place next to the sink or in your bag when you’re on the go.